A Lot Can Change in a Couple of Months! That was a day I’ll never forget! Having a brand new grand baby on one side of the hospital…then having one of our sons coming into the ER on the other side. But to get the real crux of this story I need to go back at least a year from the day the wreck happened with the lift truck…and the KOA sign. Our son, Cole had started his professional rodeo career a little over a year before. He had a great rookie season as a professional bull rider in the PRCA, winning over $45,000 in that year. He qualified for the Prairie Circuit Finals where he won the Finals average earning a trip to the Dodge National Circuit Finals in Pocatello, Idaho. In addition to his PRCA accolades he was also winning in the PBR’s Touring Pro Division and had just barely missed the TV cut for the Built Ford Tough Tour. One of the common adages in professional bull riding is, “It’s not ‘if’ you get hurt,….it’s ‘when’, ….and how bad!” Well, because of an elbow injury that took him out of competition for a few months he had to miss the Dodge Finals. And, unable to compete in the PBR he lost his standing there, as well. He had worked so hard for his dreams only to have them snuffed out! Seemed like a lot of hard luck in a short period of time. But, Cole kept a good attitude about it all. Then there was that fateful day in December of ’06! We still realize that it was a miraculous thing that he wasn’t killed that day. The initial surgery was followed by perpetual trips to orthodontists that would continue for a year or more. One of the PBR’s premier events in ’07 was the Copenhagen Skoal Challenger Finals in Oklahoma City in February. A qualifier event was to be held at the Lazy E Arena in Guthrie, Oklahoma the week leading up to the Finals. Entry fees for the event were $800. Our youngest son, Clay, did his best to talk Cole into entering the event along with him. But money was tight for Cole & Kelly who’d just been married the year before. So, it was a flat out, “No”! Clay wouldn’t leave it alone and finally talked him into it. He and Kelly put just about all they had together for the $800 entry fees. I guess you could say that everything was ‘on the line’! When the event rolled around Cole placed deep in three of the four go-rounds ending up in the top three and winning over $16,000! It also earned him a berth in the Challenger Finals on the weekend in OKC. All the top PBR Bull Riders in the world were there and the go-round winners would win a smooth $50,000!! I can’t explain how intense it was for me as 45 of the best bull riders in the world competed….just hoping that Cole would win a good chunk of the money. When it was all said and done that day…..he won the go-round……..and $50,000!! *That was exactly 9 years ago today! **Exactly 2 months from the day of Cole’s accident at the KOA sign! Cole was immediately put on the Built Ford Tough PBR TV Tour, made the PBR Finals and won well over $100,000 that year! A lot can change in a couple of months!! **Cole and Kelly were getting ready to leave the Motel 6 for the Ford Center when a couple of our great friends, Mitch & Sherrye Louis called Cole. They were sad that they couldn’t be at the event that day due to other obligations. Mitch said he’d been up praying all night and said the Lord spoke to him saying today would be a good day for Cole! Before the call Cole was discouraged to tears from bucking off his first two bulls…feeling like he had let himself,…and everyone else, down. *That phone call changed his entire attitude as he headed to the arena!! Well that might be exaggerating just a little bit….but at the time, ……and considering my ‘new’ standing in the Lord, it really was quite the test. It was in 1985 and my good friend, Danny Mason, invited me to judge his annual bull riding in Mineral Wells, Texas. It was a big event; lots of money up, and some of the best riders in the world were competing there. The crowd was huge. I’m standing inside the arena and Cade, my 2nd son who was about 3 at the time, was sitting in a box seat where I could do my judging job and also keep a close eye on him. The first section of about 12 riders was completed, there was a 10 minute break and we were about to start the second section.About that time I hear a loud voice coming from the grandstands griping and cussing about the judging. Well , immediately, I assumed that it’s someone that I know just kidding, and giving me a hard time. But I finally saw the guy coming up the walkway to where I was…..and I’d never seen this guy before! He swiftly walked my way and into the box seat section where Cade was sitting…..still yelling and cussing at me. By now he’d drawn the attention of everyone at the event. If not for his yelling voice, you could’ve heard a pin drop….and every eye in the place is on us! I said to him, “If you want to talk to me, you need to get down here and talk to me!” But he just kept on! Now, I’ve never considered myself a ‘fighter’ but I’ve also always had a resolve to not let anyone push me around, either. In professional rodeo in those days I had to ‘stand my ground’ many a time. And what made this situation even more difficult was the fact that my life had, just less than a year before, been turned around…..and I was growing in my relationship with the Lord. So I knew, to handle things how we used to handle them,….would not be the ‘right’ thing to do. Still yelling and cussing at me, I told him again, “If you want to talk to me, you get down here and talk to me!” He’s by now leaning over the top rail on the fence and I somehow resisted the opportunity to knock him plumb out, like I would’ve done only a few years before. And without thinking….I grabbed the hat off his head and just whipped him over the head with it! I then pitched it behind him in front of the grandstand and most of the 300-400 people were laughing uncontrollably…..and all my friends….well, they were laughing harder than that! When I did that, I said to him, “Now, I’ve told you about three times….if you want to talk to me, you need to get down here and talk to me! You got anything to say to me? !” He pressed his lips together….shook his head “No”, picked up his hat (amongst all the laughter) and made his way into the distance! Now that probably ain’t the best way to handle a situation like that….and I doubt that Jesus would’ve whipped him over the head with his hat…..but considering the alternative….I think I did pass the test! 8378 Zulu…..And the Flight That Was Almost the Last One! August 12….A Day That Lives in Infamy…..*at Least For Me! Avoid the Vending Machine, Microwave, Green Chile Burritos in the Albuquerque Airport At All Costs! The year was 1981. I was on track to make the NFR (National Finals Rodeo where the Top 15 in the World compete) in Oklahoma City. I had caught a ride with PRCA World All-Around Champ, Paul Tierney. Paul had leased a twin-engine plane and hired a pilot for the rigorous rodeo run through July and August. We flew to Custer and Aberdeen, South Dakota where I’d won the bull riding at both places. I had left our plane in Sturgis, South Dakota. I’d be back to Sturgis late that night where I’d meet my traveling partners, Gary Toole and Ricky Bolin. We’d leave there about noon-ish the next day for Hill City, Kansas. The day before one of my main instruments had stopped working in our plane. The ‘attitude gyro’ just quit working. The ‘attitude’ instrument tells you if you’re climbing…or descending, or turning left or right. It’s an extremely important instrument. I had asked the pilot of Paul Tierney’s plane about it. He told me that, as an alternative, I should watch the compass….and that anytime the compass was moving…I was turning. I did not have an instrument rating but was fairly proficient in using my instruments in flying. I was a good, safe pilot…..unless you ask Julie! Earlier in the year Julie and I, and Denny Flynn were flying to Del Rio, Texas to the Super Bull, the George Paul Memorial Bull Riding…which was the largest, highest paying Bull Riding event in those days. In making my landing approach I came in ‘a little hot’, had to make a fly around and then made a perfect landing. Julie tried every way in the world to get another ride home from Del Rio…but to no avail….she was forced to ride back home with me in the plane. We made it home fine but she was pretty hard to get loaded up in the plane after that! I made it back to Sturgis sometime after midnight. The next morning the weather around Sturgis and Rapid City was overcast with some thunderstorms and low cloud covering. We were ready to head out for Hill City but I wasn’t going to ‘chance it’ with the marginal weather…and the faulty instrument. The weather reports were telling us that the clouds were moving out and we should be able to fly ‘clear skies’ all the way to Kansas. As soon as we got the good report we were taking off and headed for Hill City. Only about 15-20 minutes into the flight the weather changed dramatically……for the worse! Heavy, dark clouds moved in and the ‘ceiling’ was only 300 ft. We stayed below the cloud covering, which is pretty dangerous considering that there are communications towers taller that that! The clouds appeared to be about 50 ft thick. We’d see huge gaps in the clouds of blue sky. The clouds were dropping even lower and I knew I had to try to go above the clouds. I told Gary, who was flying the right-hand seat, to keep an eye on the ground and I’d try to take it up through one of those patches of blue sky. Almost immediately we were encased in clouds….couldn’t see up, couldn’t see down. It sounds crazy but when you’re in the clouds like that you can be flying upside down and can’t tell it. It’s like being inside a paper bag. I remember my flight instructor teaching me that you can just turn an airplane loose and it’ll fly by itself. That’s great if you’re several thousand feet up, but we’re 300 ft above the ground. That wouldn’t work! I looked at the compass and it was moving (which meant we were turning). I turned the yoke (the wheel) loose and the compass turned even faster. Not good! We were all in panic mode when Gary grabbed the yoke and pulled it straight into his chest. A No-No in most conditions…..and if the plane happened to be upside down…it’d fly us right into the ground! Well, that didn’t happen; within a few seconds we cleared the clouds and our wings were vertical to the ground and we were climbing. I grabbed the yoke and brought it back to a horizontal, straight and level position. We were all exhausted from the stress of those few minutes. In 5 more minutes we were flying south with nothing but blue skies ahead. I look back at that day often and it seems obvious to me now that the Lord had everything to do with preserving us that day…..and saving our lives. 8378 Zulu made it safely into Hill City, Kansas! August 12…..A Day That Lives in Infamy……*at least for me! Well, maybe that’s a little overstated…Ok it’s way overstated. But it was kinda devastating for me in it’s own little way. It was 34 years ago today at about four o’clock in the afternoon in Sydney, Iowa. For those unfamiliar with professional rodeo Sydney, Iowa is a great rodeo. It’s one that all the cowboys like and about everybody on the trail tries to get to Sydney if at all possible. It’s a small farming town but several thousand spectators come from miles around to see the great rodeo there. The local, between performances, hotspot was Russ’s. A little, nothing special of a bar except during the rodeo you can get all the homegrown tomatoes, cucumbers and corn that you can possibly eat….and of course the beer was cold. This was going to be my last year of rodeo. I had decided that before the season ever started. Clint was three years old and there were several times during the season that I’d leave the ranch knowing that I wasn’t going to see Julie and him for 3 or 4 weeks. I could hardly take that. When I’d be leaving on one of those month long trips there’d be all kinds of bawlin’ and squawlin’……and every now and then they’d cry too! I was having a good year despite not drawing great for several stretches. It had been a dream since I was a kid to go to the National Finals Rodeo. 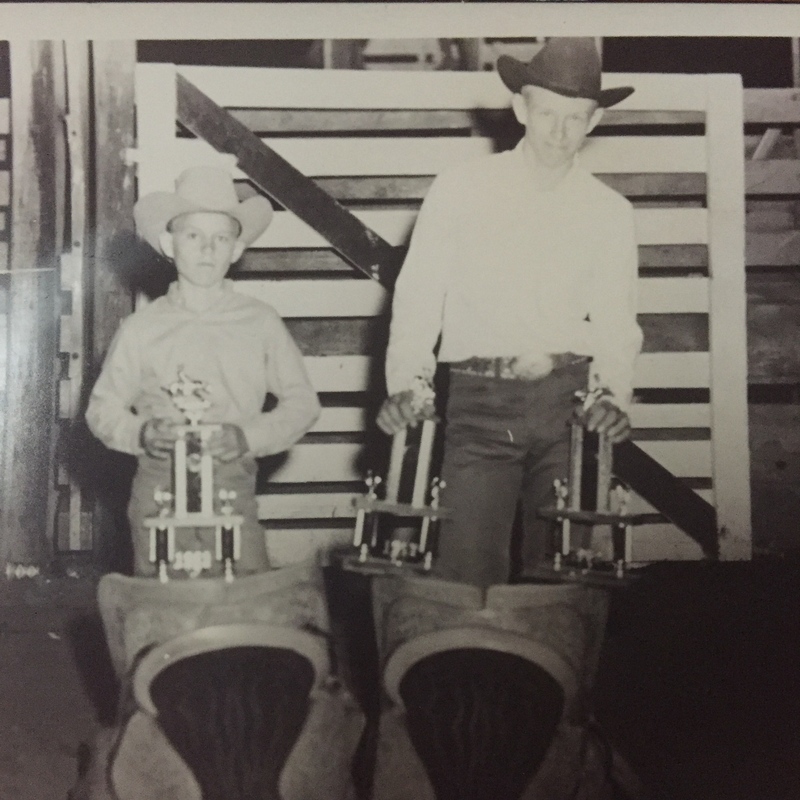 (For the non-rodeo people….it’s like the World Series of rodeo) The previous two years I had been on track to make the NFR only to be derailed by injuries that kept me out of competition, once for a month and another for nearly two months. But this year was going to be different. I was drawing good and riding good and was about to be on a good roll. In the most recent PRCA Press Release I was ranked 10th in the world; I’d just won the bull riding at Yuma, Colorado the day before. I had a decent bull at Sydney that day and then I had about 5 or 6 good ones in a row. It’s a time of the season that you can compete at two rodeos a day for nearly a month. So everything was shaping up for me to make my move…and who knows maybe end up among the top 5 in the world…and pretty much a guarantee to make the NFR. My bull that day wasn’t one of the best ones but one that I might be able to place on. He was definitely one that I should ride considering the confidence that I was riding with at the time. Well, anyone that knows rodeo knows that ‘what ought to happen’…..rarely does! Lots of variables to deal with, to say the least. The bull bucked me off extremely awkward and I landed hard on my left shoulder, dislocating it. Game over! Season over! Career over! (I laid off for a month and entered a couple of rodeos but the shoulder was far from being stable enough for me to be competitive) Interestingly enough, exactly 5 years before…on August 12, at the same rodeo a bull had hit me in the right shoulder, tore the main ligament, requiring surgery and ending my season. It sounds strange and probably doesn’t make sense to most but I had a tremendous sense of relief as I boarded my plane in Omaha the next day. An unfulfilled dream was hard to reconcile but the reality of knowing that I was going home to Julie and Clint, for good, sure did feel good. It has bothered me some down through the years that I didn’t make the NFR. It does feel good to have the respect of the guys I rode with and against….but I never regretted coming home to be a Husband and a Dad! If you’re not familiar with the Professional Bull Riders organization this post might not mean much to you. And if you’re not familiar with the PBR….maybe you should be. Bull Riding is the most extreme of all the extreme sports. If you have a disagreement on that thought, go get on a bull and, chances are, you’ll quickly change your mind. Bull Riding as a sport has evolved over the past 20 + years into a high-profile, spectator friendly sport that has made celebrities of the bull riders, as well as the bulls. Sports arenas around the country are filling up when the PBR comes to town much due to the overt, raw danger of the sport and the vanishing individualistic nature of the, authentic, American cowboy. An event was held this past weekend in Decatur, Texas unlike any Bull Riding event ever before, and almost assuredly, will never happen again. “Unfinished Business” pitted eight of the most high-profile PBR Bull Riders in the organization’s history, all retired for a number of years, riding for a, winner take all, $160,000 payoff. Cody Custer and Mike White, PRCA World Champions; Tater Porter, J.W. Hart, PBR World Finals Champions; Justin McBride, Chris Shivers and Michael Gaffney all PBR World Champions and Ross Coleman, perennial PBR World Finals Qualifier. Shivers and Hart rode their bulls and split the $160,000. The other six didn’t complete their 8-second ride. But, just like always…..they gave it everything they had…..one last time! I care about Bull Riding; I’ve been directly involved with it in one way or another pretty much my whole life. I’d like to see Bull Riding continue to come to prominence as a sport. My reasons are personal. But I look at the field of bull riders today and I wonder who’ll take the place of these men. I don’t see very many out there on the radar screen, today, the caliber of these guys in the way of sheer effort….and the desire to be ‘ambassadors’ for the sport. The door’s wide open for some ‘young guns’ to step up! Thank you Cody Custer, Mike White, Tater Porter, J.W. Hart, Justin McBride, Chris Shivers, Michael Gaffney and Ross Coleman….for showing unprecedented ‘class’ with every ride and every interview your entire career! Thanks from us older guys that never had the opportunity to ride for a million dollars. Thanks for showing the rest of the world what the sport of Bull Riding is really about! You finished your business…..and you finished it well! !